Randy Newman might think differently, but we think the Hercules Transformer Jr. Mic Stand is perfect for any low-profile miking application. 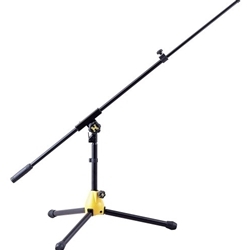 It features an EZ Mic Clip for easy mic insertion and removal, the EZ Height-adjustment lever for 1-button raising and lowering, a tilting base, and a tripod base with swivel legs that give you more positioning options. Sweetwater drummers and studio engineers alike appreciate the flexibility and convenient features of the Hercules Transformer Jr. Mic Stand. Quick-N-EZ height-adjustment lever releases and locks with the touch of a button.